1965 - On February 15 Canada raised a new flag on Parliament Hill. After much controversy and a competition to find the best design, Canada gave up its old flag with the British Red Ensign in the corner and began to fly its distinctive red maple leaf. 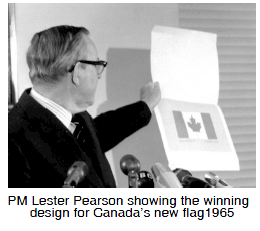 Prime Minister Lester Pearson thought a new flag without British references would be better for Canadian unity, but some people regretted the loss of this symbol of the British connection in our history. Ontario premier John Robarts responded by adopting the ensign as the flag of Ontario which was probably more fitting, anyway. 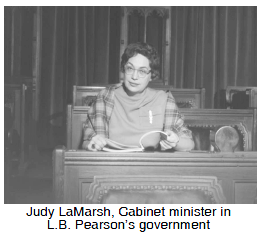 1965 - Historic outport communities in Newfoundland began to disappear with the Fisheries Household Resettlement Program. This was a programme of aid offered to encourage the people of these remote fishing communities to move to bigger centres so that services like schools and hospitals could be centrally organized and large fish plants could take the place of smaller independent fisheries. Although this seemed to be more efficient, it lead to the loss of a culture hundreds of years old. 1965 - Free trade in the automobile industry was introduced when the Auto Pact was signed between Canada and the United States. This allowed American cars to enter Canada duty free and Canadian-made cars and auto parts to enter the U.S. duty free. 1967 - Canada celebrated its first hundred years in 1967 with a world's fair, Expo '67, held in Montreal. 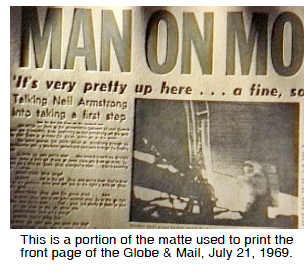 1969 - On July 20 the first human beings landed on the moon. When American astronaut Neil Armstrong first stepped on the lunar surface he made the famous statement, "This is one small step for man, but one giant leap for mankind."